January 16, 2018 - by benign0 - 16 Comments. John Nery makes a good point in his Inquirer piece today where he writes, that the decision of the Philippines’ Securities and Exchange Commission (SEC) to shutter Rappler for offenses against laws limiting foreign ownership of media companies is “grossly disproportionate” when given the bigger context of “press freedom”. But Rappler is a news organisation that banked on not much anything loftier than popular appeal. Maria Ressa herself spent much of her stint as its CEO drumming up support (both financial and readership) on the back of social media clout. As such, while the “press freedom” card is a valid one, that card was played once too many by Ressa — for that matter, by the entire media industry — for the wrong reasons for too long. Indeed, the very criticism mainstream media attracts overall revolves around Filipinos’ profound cynicism over the lofty pedestal media had been set upon. The now-widespread belief that corporate media had chosen to abuse “press freedom” rather than wield it for the greater good had been growing over the last 30 years and has reached its crescendo today. Rappler was the straw that broke the camel’s back. Over its five-year existence since it bubbled up from the muck in 2012 (in time to weaponise itself for the battle to crush the late Chief Justice Renato Corona), it managed to singlehandedly give the Philippine news media industry (then already struggling for relevance and credibility) an even badder name. Its “innovations” in the pracitce of journalism — being “online only”, styling its writers as “online journalists”, calling itself a “social news network”, and making itself the news then reporting about itself — rubbed the mainstream old school the wrong way. Today, as this “media crisis” unfolds, old journo stalwarts would, of course, deny that they grudgingly watched as the hipster Rapplerettes stomped all over their orthodoxy over the last five years. Seeing that they are being emotionally-blackmailed to “stand with Rappler” now makes their tepid response to the demise of the New Kid understandable. But to the broader public, that Cold War Era “press freedom” thing is just plain obsolete. If I were to manage the PR blitz Rappler needs to mount to keep its head above the torrent of bad press and bad “engagement” already raging across the Internet, I’d junk the “press freedom” angle. Using the “press freedom” mantra will not convert the unevangelised and will, instead, further polarise opinion. All it will do is escalate the singing of the Yellowtards’ inbred choir to a shrill pitch and further enrage (or, worse, merely amuse) the unconverted. As Ben Kritz tweeted earlier, “Anybody connected with Rappler could take to the web with a blog and say whatever they like, and govt would never touch them. That’s freedom of speech.” Indeed, beyond Rappler exists an entire ecosystem of Opposition “social justice warriors” tapping away tweets and Facebook posts from their two thousand-dollar Apple devices at the corner Starbucks cafe. The whole notion that the Rappler crackdown is an “assault on freedom” is therefore absolute nonsense. The fact is (scraping off the annoying layer of shrill slogans being fielded by “activists”), the troubles Rappler suffers today is more an outcome of its CEO’s negligence. Ensuring compliance to regulation is a basic housekeeping function of any business organisation’s core administration. Rappler apologists are doing the equivalent of complaining about a curtailment of their right to drive after being caught speeding. Non sequitur. The activist “cause” is not on the same wavelength as the underlying principles at stake. Cops aren’t particularly sympathetic to such appeals when the complainant is an adolescent driver on a probationary license. In the case of Rappler, the recklessness it exhibited as an adolescent news organisation is fully on record — though perhaps this “evidence” of teenage angst will disappear once the plug is pulled. Thus, the curious case that is the shut down of Rappler by the SEC — there is no evidence used to wrap tinapa. The adults amongst Rappler‘s supporters should leave the “press freedom” angle to the kiddies and focus on fixing the real problem. Perhaps start with re-evaluating Ressa’s role as CEO. She obviously ran her “social news network” aground. CEO’s are the easiest employees to fire. There are people within the Rappler family, after all, who do real work, and their jobs may, to be fair, be worth saving. For that, you need a real CEO at the helm to manage his or her organisation through this crisis. Social media caricatures like Ressa are simply not up to that task. Previous Article Game Over for Rappler! Interesting that Duterte has consistently stated his intent to (rightly) liberalise foreign ownership in the Philippines. Yet, of all the companies operating in the Philippines, the government singles out the media firm that consistently criticises it for violating foreign ownership laws. Food for thought. I dont know… After living in the Philippines I have found it to be an extremely anti-foreigner competitive nation when it comes to businesses. Yep, agreed. Doubtful anything will come of foreign ownership reform. But back on my point when you consider the pattern of (1) his touted election promise, (2) his authoritarian anti-press tirades and (3) selective targeting of one (1) media company over foreign ownership issues… It reminds me of early days Hun Sen. Scary stuff. I’m sorry but they violated a part of the constitution. Foreign ownership of other businesses would not compromise the country as compared to, say, a media group which has the agenda of a foreign country. It’s not like they are singling out this organization. It just so happened that they’re the only one who violated the law. Certainly it’s not difficult to comprehend the concept of enforcing *existing* laws while trying to craft new ones? Why do you think we incarcerate peddlers of MJ despite a powerful lobby and a sympathetic president. Hmmmm… EVERYTHING in the document seems consistent with what I write. What I’d like to ask is if the PDRs are considered foreign ownership. I personally think owning a PDR is like owning a stock in a company and would mean ownership. What are your thoughts? Glad you read the decision too! If you read the decision, it clearly states that those PDRs owned by Omidyar are void precisely because they gave control of Rappler to Omidyar by “special arrangement” (notice how the decision does not void the “other” set of PDRs, only Omidyars). So to paraphrase the decision and answer your question, PDRs are not per se “foreign ownership”, but the PDRs owner by Omidyar are. “Note that PDRs are not evidence of foreign ownership. It is the contractual provisions in the PDR that will determine foreign control and/or ownership. In Rappler’s case, the PDRs granted its investors some control. Why don’t you point out the part that seems objectionable to you? Just to kickstart discussion. I read that ruling and can’t find anything wrong with this article based on it. Whether or not the PDRs can be considered equity investments (and grant influence to the investor on operational decisions), it seems, will be the core of the debate. The SEC asserts that they are. Rappler will likely argue that they are not. Rappler has argued, and will undoubtedly argue again in its inevitable appeal to the courts that a PDR does not confer any ownership, but as the SEC ruling points out, ownership privileges (such as the requirement that Rappler confer with the PDR holders on certain management decisions) were specifically attached to the arrangement. Even if they were not, under International Accounting Standards (it’s IAS 32.16, if any of you playing along at home feel like looking it up), PDRs are considered equity instruments. Well it’s nice to have a fast and informative reply. So now we have to wonder if the SEC ruling will make corporations that also have PDR “investments” also be shut down. It seems to me like a PDR is just a convenient way for foreigners to bypass ownership restrictions but I’m happy to hear your opinion. Not directly to shut the others down. It would depend on the nature of the business and if it violates any law. Rappler is the only one we know (for now) that claims to be a media entity which is not 100% fully owned. Check CNN PH, ABSCBN, GMA and TV5 and you’ll see they have none of the said violation whatsoever. 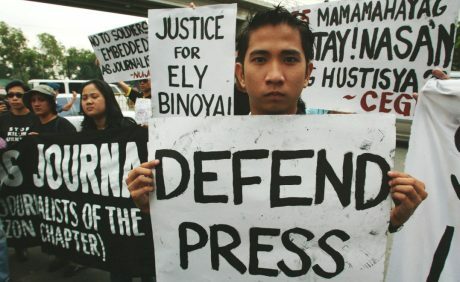 Being bankrupt and violating any laws in our country is not “press freedom”. It is plain stupidity. Rappler.com is designed by the Aquino Cojuangco political axis to control the internet trolls and Website Bloggers. These wicked internet dudes , cannot be controlled by anybody. So, they planned a way to control the cyberspace or hyperspace. It was a vicious battle between these evil trolls and blogger, and Rappler.com , together with the mainstream media. Todays’ Information Technology territory is an uncharted territory. We can find: evil trolls, wicked bloggers, paid hackers, hired trolls/ bloggers, and other unsavory characters in this uncharted territory. Rappler.com was not familiar with the Information Technology territory. Maria Reesa , invested a huge amount of money in her company , to venture in this ‘uncharted territory”. Her company was easily defeated by these vicious characters, who were waiting in the nooks and crannies in the uncharted territory. What a stupid woman is Maria Reesa ! People’s abuse through journalism should not be taken as freedom of press.